If your employer believes that you are not performing your job up to the required standard they could terminate your employment on the grounds of capability. This could happen because if they perceive you don’t have the right aptitude or skills needed for the position. It is also possible if they believe that you are unwilling or reluctant to do your job correctly, despite your capabilities. In cases such as these, the employer may choose to deal with the issue by dismissing you after following the statutory disciplinary and dismissal process. 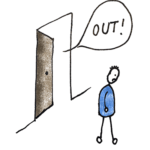 This category of dismissal is called capability dismissals. To prove a ‘fair’ dismissal, an employer must show that they have acted reasonably and fairly in carrying out the dismissal. Cases under this category are quite rare, as most employers must be aware of the employee’s qualifications before offering them the job. Qualification may become relevant when any candidate applying for the job provides false information about their qualifications on their job application. An employee is held to be incompetent when he or she is not able to perform their duties as specified under the terms of the contract. Examples of incompetence may include slow task completion rates, lack of adaptability, continual mistakes and inability to work alongside colleagues. If an employee takes leave from work for prolonged or unspecified periods of time, citing health concerns, the employer may potentially rely on this reason to show that the employee is unable to do their job and dismiss them. If an employer cites incapability as a reason for an employee’s dismissal, they need to show that they have given the employee a fair opportunity to improve their performance or return to health before joining work. 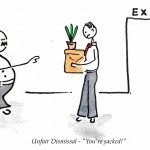 In case the employer fails to do so, then the employment tribunal may rule the employee’s termination as an unfair dismissal. Your employer must follow a statutory disciplinary procedure (as set out in the contract of employment) before proceeding to dismiss you for misconduct. Your employer must ensure that you have received adequate training before you commence your job. Also, if your job performance is deemed unsatisfactory, you should be informed of the same and be given an opportunity to improve before any disciplinary action is taken. If you are taking frequent but intermittent or prolonged leave from work, citing health reasons, your employer must consider any alternatives before proceeding to dismiss you. This may occur if your employer changes your shift timings or assigns you flexible working hours. Employers have a legal obligation to make ‘reasonable adjustments’ to the working environment, to meet the requirements of their staff members who have a disability. 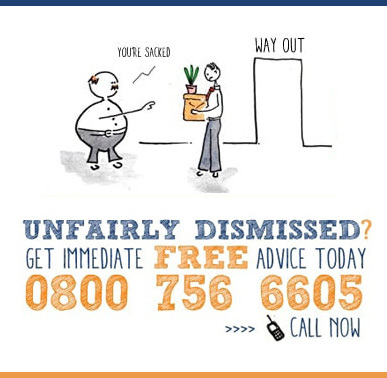 Dismissal on the grounds of disability may be considered as unfair by an employment tribunal. In case you feel that you have been subjected to discriminatory treatment or have been dismissed from your job without any legitimate reason, you have the option of raising a formal grievance. You can inform your employer in writing about how strongly you feel about the situation, while asking them to provide a written explanation about the decision. Lastly, you must consider Early Reconciliation before making an Employment Tribunal claim. For most cases, there is a 3-month time limit to bring a complaint to the Employment Tribunal. As a result, you need to keep in mind the limit while bringing your claim within the stipulated period. 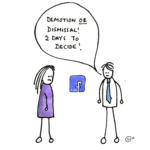 What does “summary dismissal” mean?